In almost every weather map of the Earth’s northern hemisphere atmospheric Rossby waves are a prominent feature. They appear as meanders in the jet stream separating cold polar air in the north from warmer subtropical air farther to the south. Sometimes these waves reach the equatorial regions and can even affect weather in Australia. In principle, waves of this type (often referred to as planetary waves) arise on every rotating sphere due to the Coriolis force. Saturn’s hexagon, a stable cloud pattern at the planet’s north pole, may also be an expression of these waves. The existence of Rossby waves in stars was predicted about forty years ago. “Solar Rossby waves have very small amplitudes and periods of several months, thus they are extremely difficult to detect”, says Prof. Dr. Laurent Gizon, coordinator of the team that made the discovery and director at the MPS. The study required high-precision observations of the Sun over many years. The scientists from MPS analyzed a six-year dataset from the Heliospheric and Magnetic Imager (HMI) onboard NASA’s Solar Dynamics Observatory (SDO), in operation since 2010. 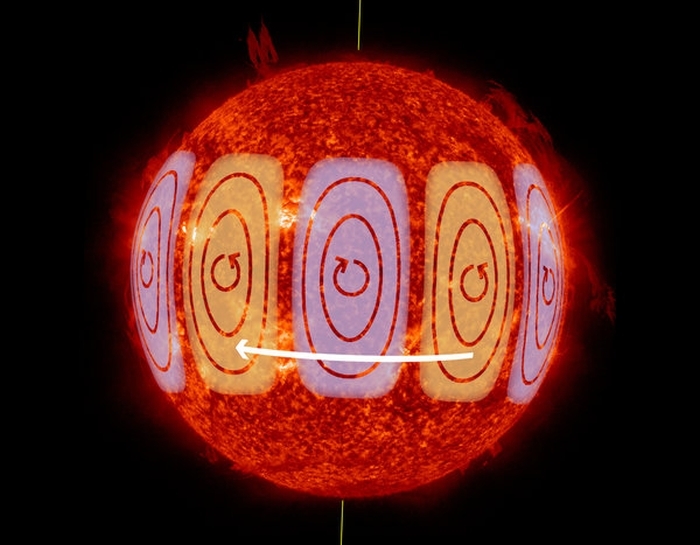 With a series of observations from NASA’s space-based Solar Dynamics Observatory (SDO), the team has revealed regions in the corona with elevated levels of heavy metal ions contained in magnetic flux tubes – concentrations of magnetic fields – which carry an electrical current. Their vivid images, captured in the extreme (short wave) ultraviolet (EUV) band, reveal disproportionally large – by a factor of five or more – concentrations of multiply charged metals compared to single-electron ions of hydrogen, than exist in the photosphere.